This month I’m traveling to Botswana and Mauritius for my honeymoon. And while I couldn’t be more excited for the trip, it’s definitely one of my most difficult travel packing challenges yet. I’m already a fan of minimalist packing, but the strict size and weight restrictions for this safari are next level. Adding beach clothes to my African safari packing list makes things even more complicated. But with a few multitasking items and a lot of organization, it’s totally possible. Here are my packing tips and list for a 5-day safari. THIS POST MAY CONTAIN AFFILIATE LINKS, WHICH MEANS IF YOU CLICK ON A LINK AND MAKE A PURCHASE, THE RESET RITUAL MAY RECEIVE A SMALL COMMISSION AT NO COST TO YOU. THANKS FOR YOUR SUPPORT! Unlike the safari I went on in South Africa’s Kruger National Park, for this Botswana safari we’ll be flying to our lodge on a small bush plane, which means must bring a soft-sided duffle bag with a 20 kg (44 lbs) weight limit. Always check with your transportation carrier, but as a general rule think soft-sided (aka no wheels or frame) and carry-on size for the small charter flights to remote lodges. Wearing the proper clothes is a good rule of thumb, especially if you’ll be going on bushwalks. If you’re only going on game drives in a vehicle, you can be less strict. Just still be mindful—no need to wear neon in the bush. 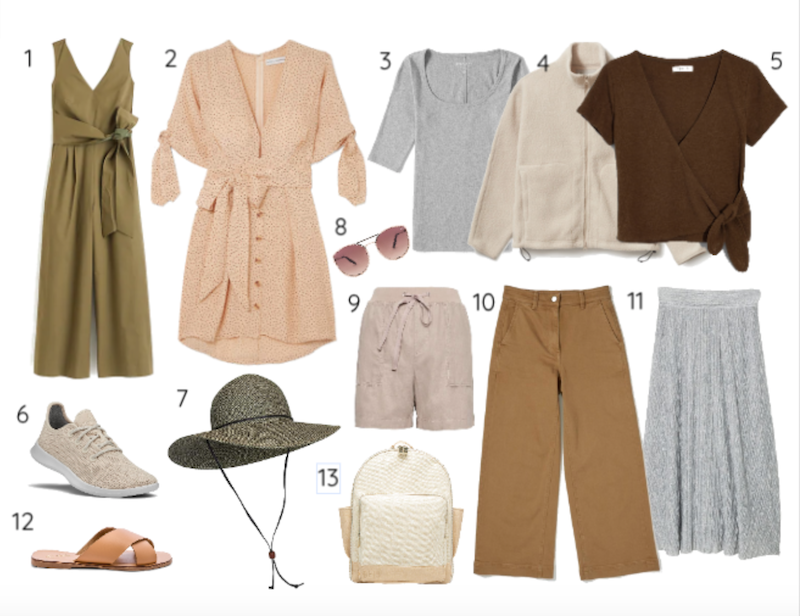 Do blend in | When it comes to safari clothes, neutral colors are your friend. Think muted khaki, beige, gray, clay and green. Stay away from black and blue (attracts tsetse flies), white (gets dirty), red and any other brights (deter animals) and avoid camouflage in Southern Africa (especially Zimbabwe where it’s prohibited). Don’t expect warm weather all the time | Always research the weather at your destination for the time you are traveling. Believe it or not, most of Africa gets rainy and cold at various parts of the day and year depending on the region. Do pack layers | Speaking of weather, you’ll want to pack layers as your game drives will be in the early morning and evening, and most likely in an open-air safari vehicle. It can be chilly, even in the summer months, and downright cold in the winter. Even if it’s not chilly, long pants and shirts will help protect you against insects and bug bites. Don’t overthink it | Unless you’re camping off the grid for long periods of time, you don’t need to pack to much survival gear or extreme outdoorsman type clothing. Many safari lodges will have laundry services, so keep it minimal and pack for a just a few days, even on longer trips. Don’t forget these Africa travel basics. You’ll definitely want to keep your safari toiletry list as paired down as possible. Accommodations range from ultra-budget to ultra-luxury so plan accordingly. You can always contact your lodge to see what they provide. Tip: Many countries in Africa have made disposable plastic bags illegal. You may be fined for carrying one in checked or hand luggage. You’ll want to think in two categories: game drives/bush walks and hanging out at the lodge. In general, safaris are casual affairs, although you might want to feel a little more put together come time for dinner and drinks, so keep that in mind. Of course, you’ll want to take lots of beautiful safari photos. Don’t forget—your camera gear will count towards your luggage weight allowance, so pack as light as possible. You’ll want to leave these items off your African safari packing list. Going on an African safari is a trip of a lifetime. Hopefully, these packing tips will help you enjoy your time and look good doing it. The Reset Ritual is where travel meets intention, reflection, and mindfulness to inspire a life well explored. Don't leave without joining the crew.